Frost has been threatening over the course of the last few weeks and although there has been a slight sheen of white on the rooftops, we've yet to experience a proper frost. 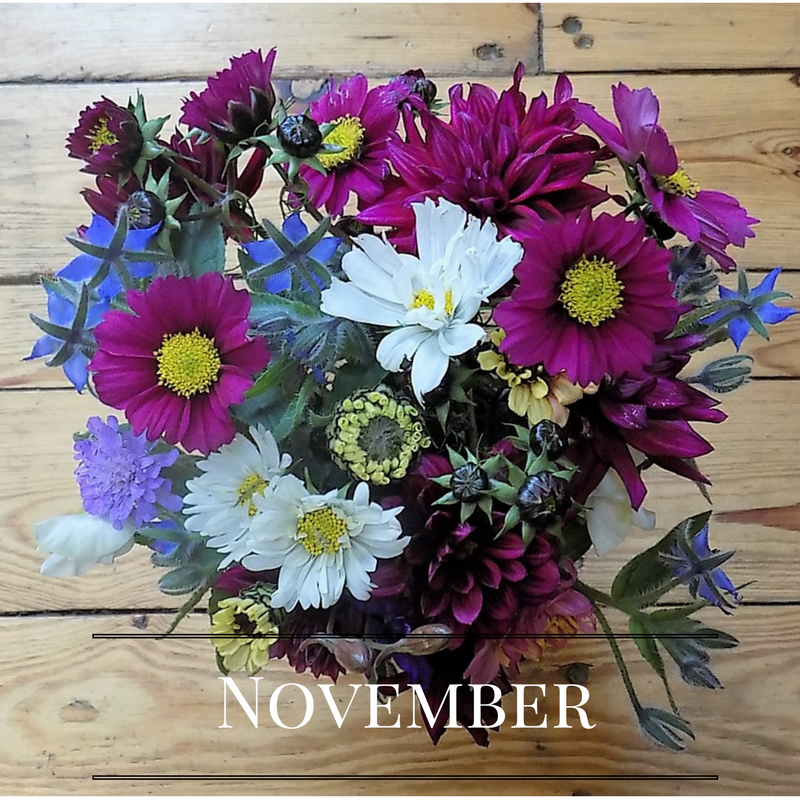 Time is ticking then for the last of my annuals which will be killed off once it does arrive. The cosmos, which are highly productive and need almost daily dead-heading, are slowing down and my dahlias are looking very bedraggled. As soon as they are blackened by frost, I will lift them and store the tubers in the potting shed for the winter. My zinnias have lots of buds that seem to take an age to open and I don't think they'll manage it before the weather turns. I'll pick them anyway for their beautiful buds. 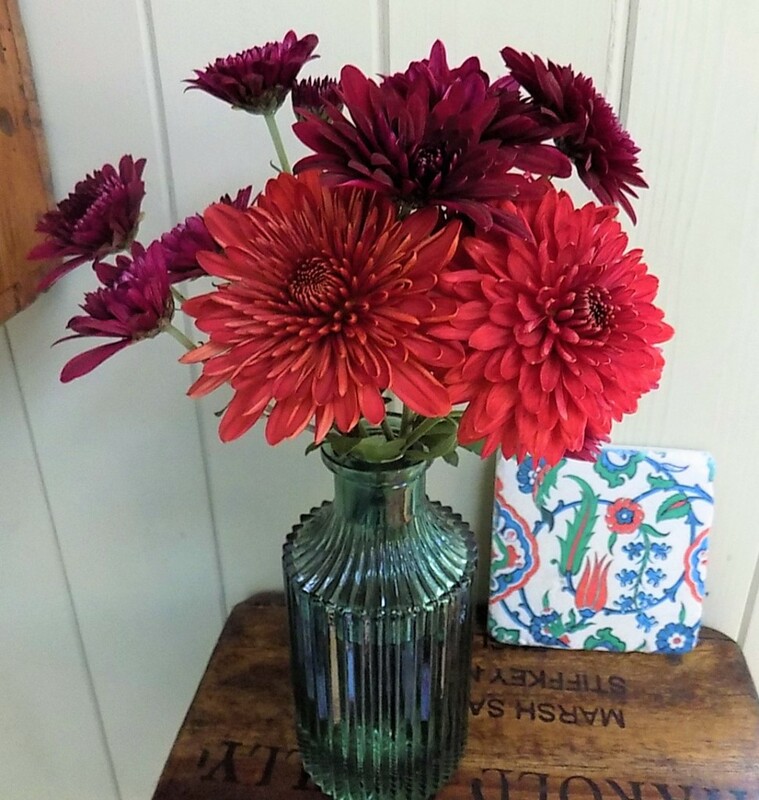 Zinnias are one of the few flowers that won't open further if picked before they are fully open. A late-sown Borage is providing very fresh looking fuzzy foliage and delicate blue flowers. My Guara (sometimes known as 'Whirling Butterflies') is a beautiful plant. It's been flowering all summer and is still going strong. Its spires of flowers add a delicate touch to an arrangement. I am even picking the odd sweet pea, larkspur and cornflower here and there which have been flowering ever since July. Despite the inevitable loss of the dahlias and annuals at this time of year, there is still plenty to look forward to in the cutting garden over the coming months. There is evergreen foliage in the form of festive Holly and Ivy which can both be brought indoors for simple winter displays. Shrubs like Viburnum tinus and Skimmia japonica, are easy to overlook for most of the year but they shine in the winter months with their scented white flowers and attractive red berries respectively. Autumn bulbs like Nerine, Schizostylis (now Hesperantha) and autumn cyclamen and crocuses are very useful for a splash of autumn colour in the borders. 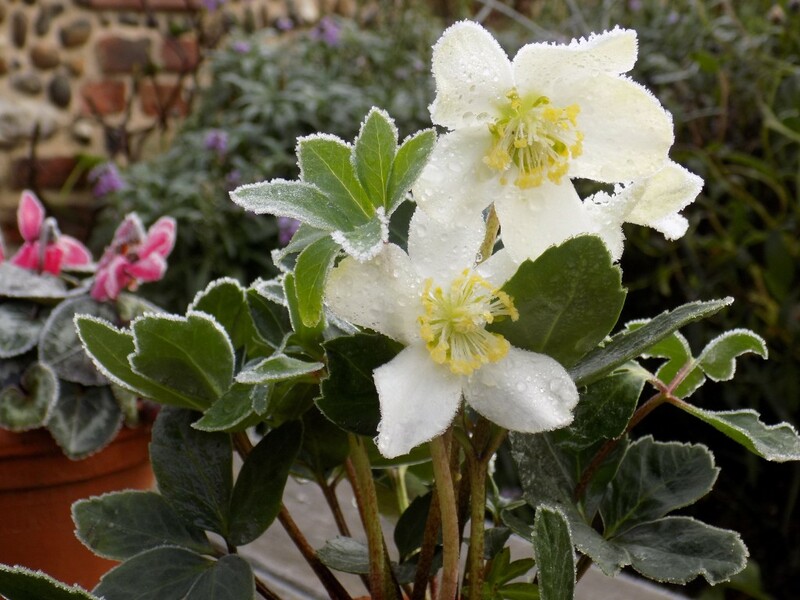 Then there is the anticipation of beautiful Hellebores which can flower from December through into spring and are my favourite winter flowers. There's a great article about the beautiful new varieties on offer in the December issue of Garden's Illustrated magazine - if only I had more space! This is the first year that I have grown Chrysanthemums and I'm left wondering why I haven't done so sooner. 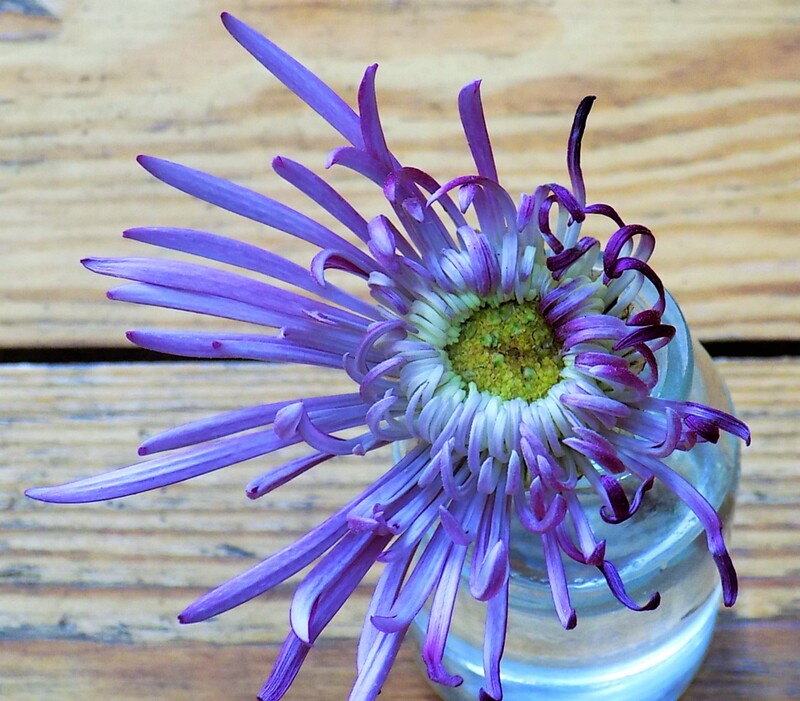 If you pick the right varieties, they can really extend your cut flower season. I've had some lovely flowers from my early flowering varieties 'Littleton Red' and 'Smokey Purple' (see earlier photo) but it is the sea urchin types like this 'Saratov Lilac' (below) that I am really looking forward to coming into flower. There are plenty of buds and some are just breaking but these plants are frost tender so do need bringing in under cover if you want to be able to pick these flowers in November. Mine have been growing in pots and have now been brought into the potting shed where I am hoping they'll be ready to cut soon. Over the last few months, I've been periodically potting up small spring bulbs - Crocus, Iris reticulata and Muscari in small terracotta pots which I keep in the potting shed for flowers a little earlier than if they were planted in the ground outside. When they start to bloom, I'll bring them into the house for some welcome colour in the depths of winter. I love the smell of Hyacinths which are great for forcing into flower in time for Christmas but I find that the scent gives me a terrible headache so I won't be growing any this year. 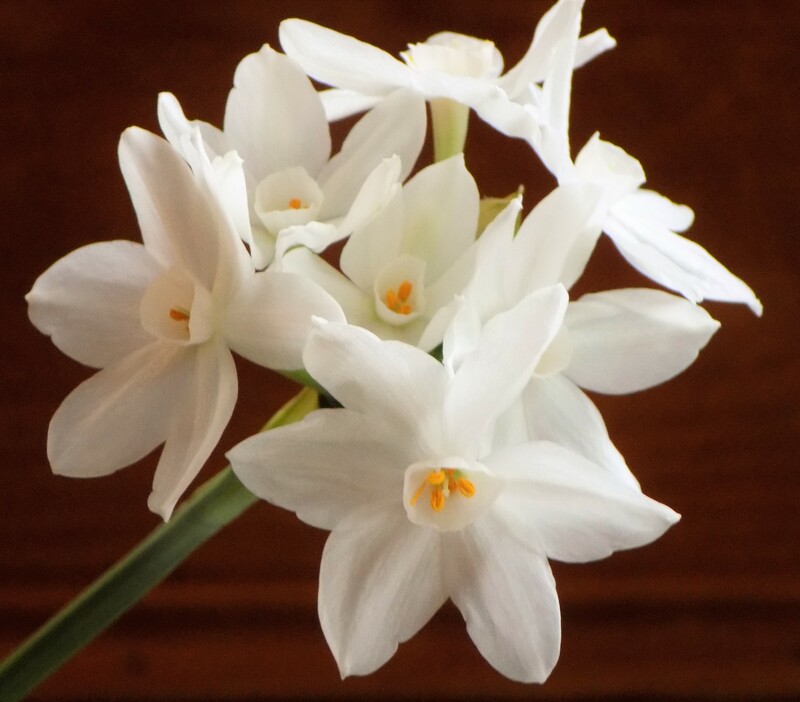 However, I love to grow Narcissus Paperwhite. These are also strongly scented but don't have the same effect on me. They are easy to grow and I have a few pots on the windowsill which are shooting at the moment and should be in flower in about 6 weeks time. I will be planting up a few more to have a succession of flowers throughout the winter. You can store the bulbs in the fridge to retard their growth until you want to pot them. Amaryllis are another popular, easy to grow bulb for growing inside over the winter months.